Facing historic declines in readership, revenues and profits, newspaper executives could use a groundhog-like critter to help them assay the future. Unfortunately, the leading candidate appears to be the ostrich. With publishers heading to New York to forecast the future performance of their companies for increasingly skeptical investors, a surprising survey on the eve of Media Week found that the executives of 14 leading privately held newspaper companies believe ad sales will increase by an average of 1% to 2% next year. Their prediction is surprising, because the authoritative industry newsletter published by John Morton and Miles Groves says this year's decline in print advertising actually will accelerate in 2007. 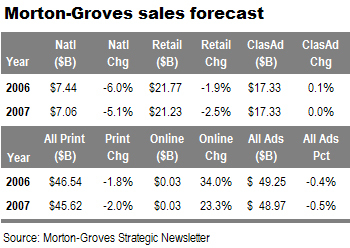 As detailed in the following table, the Morton-Groves Strategic Newsletter says print ad sales will fall 2% to $45.62 billion in 2007 after dropping 1.7% this year to $46.54 billion. Another year of double-digit online sales will mitigate the impact of falling print ad volume on total industry revenues, but total ad sales still are expected to fall 0.5% to $48.97 billion in 2007 after tumbling 0.4% this year to $49.52 billion. The bullish – or, is it ostrich-like? – sentiment expressed by the surveyed newspaper publishers also surprised Paul Ginocchio, the securities analyst at Deutsche Bank who conducted the poll. Splitting the difference between the two extremes, Paul believes newspaper revenues will gain a modest 0.5% in 2007. The disparity among the predictions is understandable, given the many variables roiling the newspaper industry. But the industry's recent track record, as portrayed in the graph below, hardly warrants irrational exuberance. Paul thinks newspaper sales were so dismal in 2006 that 2007 won't look too bad by comparison. He believes retail advertising will stabilize after such seismic shocks as the Macy’s consolidation and the auto sales collapse. Both analysts are concerend that demand may deteriorate next year for recruitment and real estate advertising. 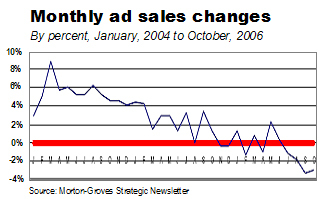 Despite inroads by the online recruiting sites, help-wanted advertising was reasonably solid in 2006 for newspapers. The success of the Career Builder collaboration with Gannett, Tribune and McClatchy/Knight Ridder has encouraged other publishers to hook up with Hot Jobs or Monster. Thanks to the new alliances, this category, if the economy falters, may trend better than otherwise would be expected. Real estate has continued to be strong despite the malaise in the housing market, because agents and homeowners hope additional advertising will stimulate slow-moving sales. To the extent that discouraged owners start pulling their listings off the market, real estate advertising could take a dive. In Paul’s survey, 8 of the 14 the publishers predicted that profits will rise in 2007, thanks to falling newsprint prices, lower energy prices, headcount reductions and economies achieved through the industry’s growing use of innovative outsourcing. Although the executives responding to Paul’s survey publish papers of all sizes, the group is weighted somewhat disproportionately toward small and medium publications, which typically have been less affected than metro papers by the deep declines in advertising from national and major retail accounts. The views of these publishers may be affected by the comparative ease to date of operating their franchises in relatively isolated and defensible local markets. Or, it might be the sand. Go back! It’s a trap!